This artwork is for Life Book 2013 wk36, a catch up lesson for me. 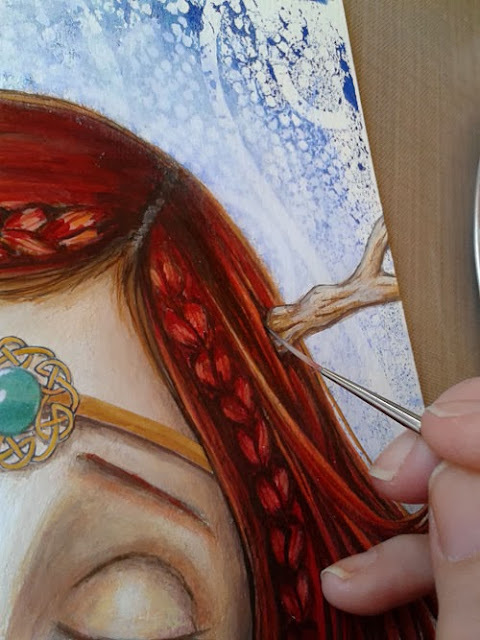 As usual, I deviated a bit from the lesson and ended up with a bit of a Celtic feel to this painting. 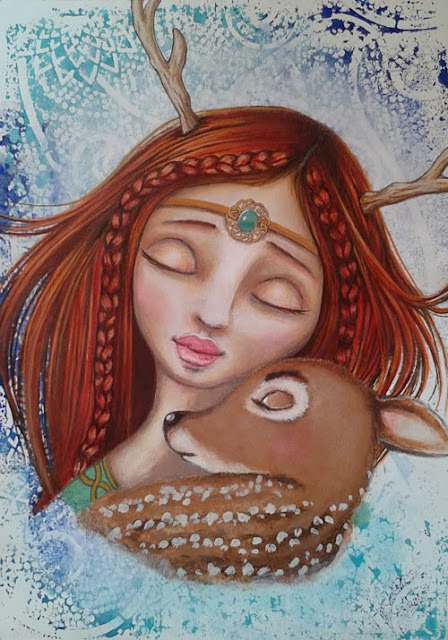 Erecura is the Celtic Earth Goddess and I thought she would fit this painting perfectly. After returning from Ireland recently, I was still missing everybody terribly, especially our new granddaughter.Therefore, this is a little reference to them. Tamara Laporte mentions in her class how sometimes she is conflicted with being a painter or an illustrator. I can identify totally as I would like to be more of a messy painter. More often than not, before I know it, I am leaning on the illustration side of things. Not to say that is a bad thing but sometimes it is good to not paint in between the lines or get bogged down with details. Here is an earlier page of mine from Life Book 2013, notice the stencil in the background, I patted off the dylusions inks left on the front of the stencil onto spare watercolour paper, to use at a later stage. Instead of staring at a blank page this can come in useful when you don't have a clear pallet or focal point. In my case, I just hate wasting good inks! 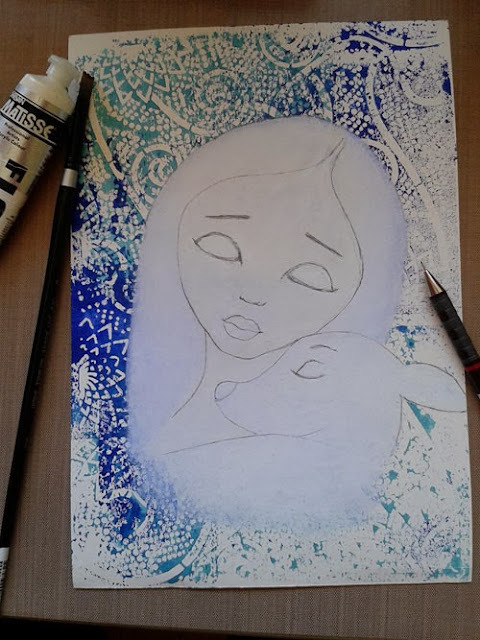 After sketching my idea onto the textured paper, I used white gesso primer to block out the background on the main figures. 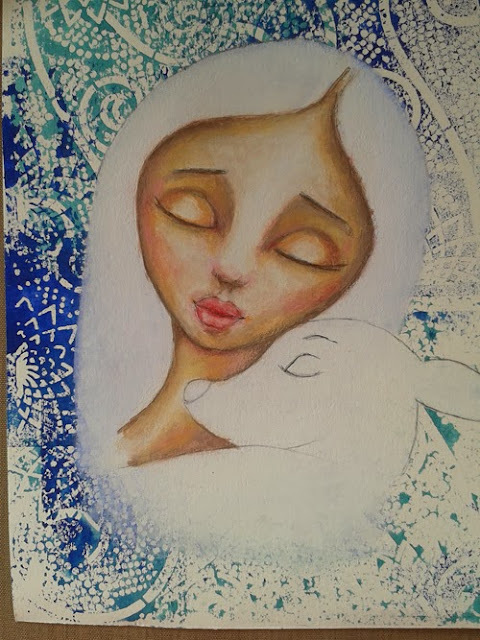 Just starting to get in the base colours for the skin tones using acrylics and caran d'ache watersoluble crayons. After painting in the fawn, I added gesso primer around the figures and used a brayer to blend it in. I then turned my attention to the hair which I am not quite feeling yet and decided to give her a bit of a windswept look. Be mindful when working on top of dylusions inks, as they will bleed when moisture is added on top of them. For this Life Book lesson we were supposed to use a transfer either using a printed transparency sheet or a paper print out. It was a particularly hot day here and the paint on my brush was drying out quicker than I could paint! So not ideal conditions for using the transfer method. Instead I drew this Celtic design, scanned it into Photoshop added the green gem and printed it out. After spraying it with workable fixative to set the inks, I painted over it to blend it in more with the painting. 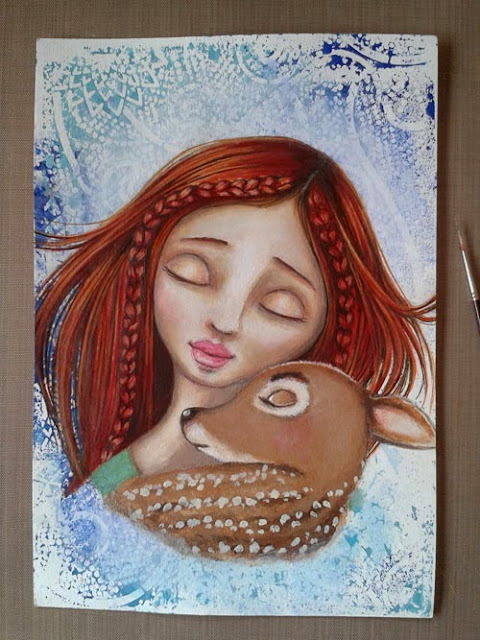 I thought a pair of deer antlers on the girl would work well with this piece and then continued around the image adding the final touches. Well, I was trying to aim for messy in this painting but as you can see I ended up somewhere in the middle! I don't think it is so easy getting that detail girl out of me haha! How about you? What type of artist are you? Have you changed your style, was the transition easy? I would like to hear about it! 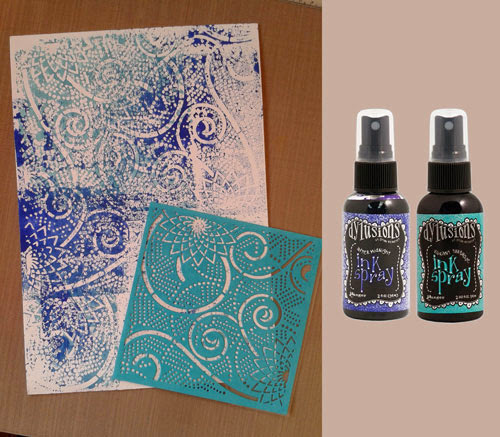 Also in the past I have tried transfers using gel medium or hand sanitizer with a printed transparency sheet or a paper print out. I haven't had great results and I was just wondering have you had any experience with transfers? As always comments are welcomed and encouraged. Enjoy your week, thanks for stopping by. Ohhh Myyyy! Serena, I just have no words to describe how much I adore this piece! Not only the subject matter is so endearing and enchanting, but your technique and drawing/painting ability are just superb! 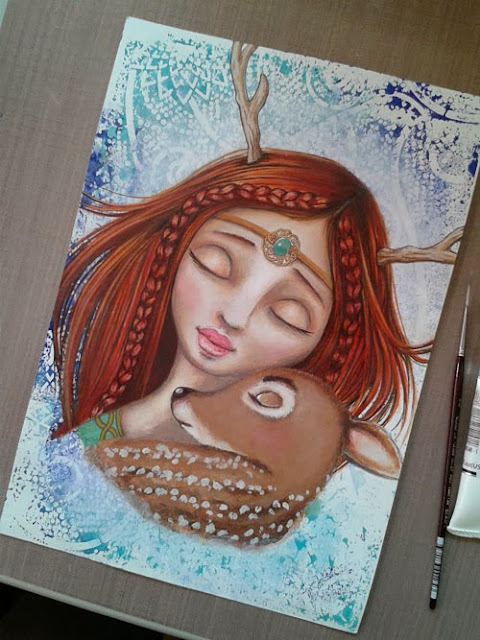 Such great ideas, their closed eyes and the shadowing on them, their sweet and loving expressions, and then the details that you added, the antlers, her braids, her hair that you draw and paint so well, this is just stunning and it really does have an Irish feel about it. Great background! I am like you, try to be messy but I'm all about detail, and it's so hard for me to change and do loose paintings, my best intentions always end up being so much work, and detail prevails I'm afraid! CONGRATULATIONS on this Serena, another typical masterpiece of yours! Fabulous blog post and great work as always - I love the detail and care you put in to everything that you do. So beautiful, I love her hair soooooo much! Your paintings are brilliant ! I have never heard of gesso premier, what is that? Wow ... she is stunning. 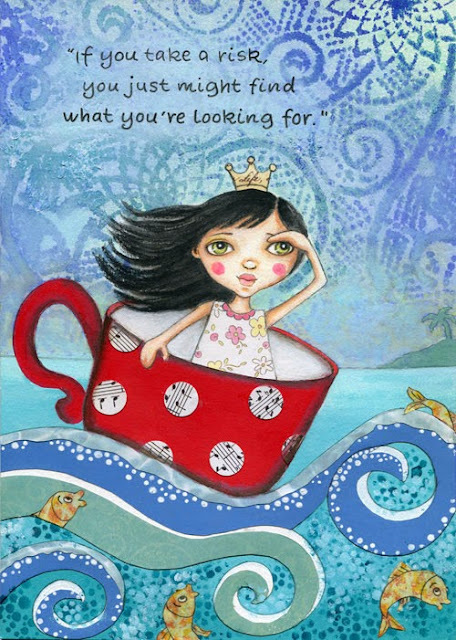 New to your blog ... totally inspired! Another new to your blog and amazed and love this page. Beautiful girl, and I have a fondness for Celtic. Love the art and music. Would love to know some details on this stencil also. I just adore your work. Erecura with the Fawn is truly beautiful.